This is part one of the review as I have yet to do anything but squeal over my Zazzle custom fabric. As you can see it is very light purple, has the Viva la Feminista logo and my motto "Peace, Love & Feminism" printed on the fabric. I am not a pro with fabric. I know how to sew and once I get my sewing machine all set, I will be turning this fabric (I have 2 yards) into a skirt. Yup, if you see me at a blogger and/or feminist event, you might catch me in it. #NERD. 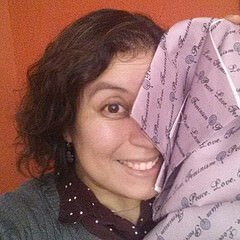 But since my BFF, Cinnamon, is a fabric pro I asked her for thoughts on the fabric itself. The printing is well done. The ink did not bleed. Apparently Cinnamon has seen custom fabric where the ink did bleed. She also gave the thumbs up to making a skirt with the fabric, which is the Pima cotton. I am super excited to make my skirt and see if I can make something else from it.So stick around to see how my projects turn out! And new fabric designs I'll doodle up.